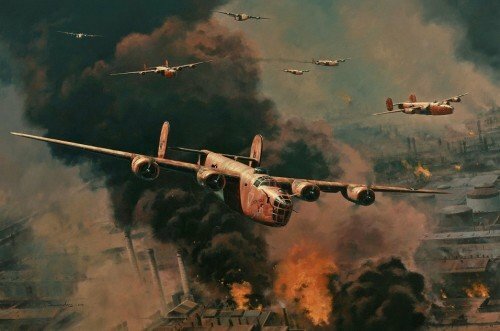 Flying at low-level over the Astra Romana oil refinery,Lt James Merrick of the 98th Bomb Group powers his B-24 ‘Lil De-icer’ through the pall of burning debris as time-delayed bombs, dropped in error by a previous Group, explode beneath them. With any hope of surprise now lost, and taking heavy losses in the process, the crews of the 98th bravely hold their bombers on course. Allied planners knew that just over a third of all Germany’s oil came from a single source – the oil fields at Ploesti, far to the east of deepest Romania. If the oilfields and refineries at Ploesti could be destroyed, then Hitler’s armies would be dealt a savage blow from which they might never recover. Anthony Saunders’ dramatic painting, specially commissioned to commemorate the 70th Anniversary of Operation Tidal Wave, pays tribute to the heroes who flew the epic Ploesti mission.